Colorado’s health insurers appear largely unshaken by federal actions that risked destabilizing the Affordable Care Act (ACA) insurance markets. 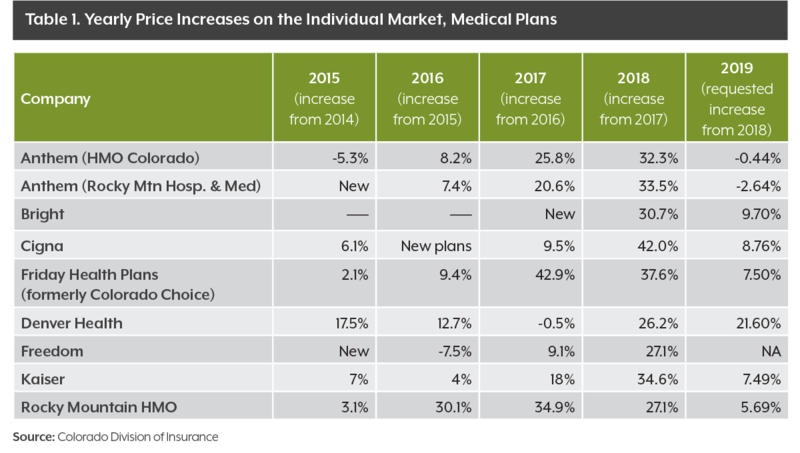 Companies requested an average price increase of 5.94 percent for 2019 health insurance policies on the tumultuous individual market — the smallest increase since 2015 and far less than the 32 percent increase in 2018. Further, no carriers are dropping out of the Colorado market, and together they plan to sell nearly the same number of plans in 2019 as they did this year. The price of small-group policies, meanwhile, is projected to rise 7.15 percent. This market has seen mostly nominal price increases the past five years. 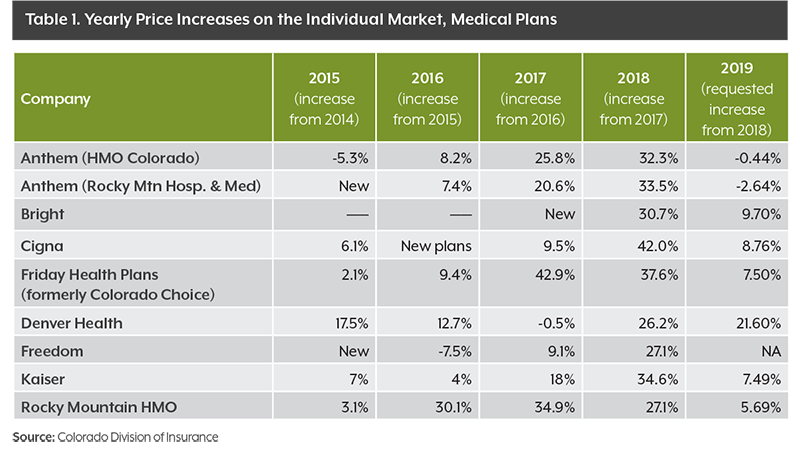 The Colorado Division of Insurance released rates for individual and small-group market health insurance plans that companies want to sell in 2019 on July 13. The rates are preliminary requests and won’t be finalized until the division approves them later this fall. A full geographic breakdown of prices won’t be available until rates are finalized. The relative stability is striking after three consecutive years of price increases of 10 to 30 percent — or even more in some counties. 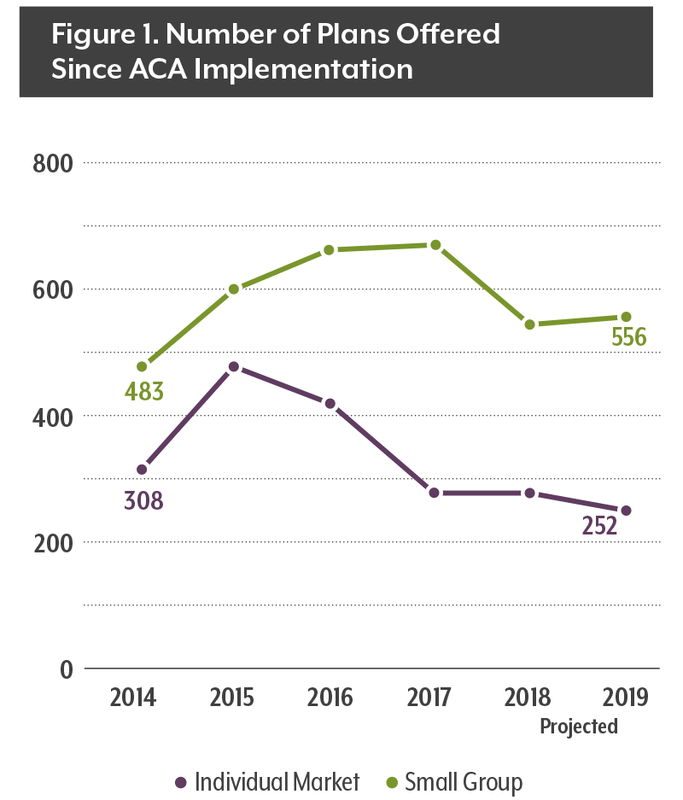 It’s also noteworthy given that the past 18 months have also seen a sustained attempt to repeal parts of the ACA that undergird the individual market. Congress repealed the penalty for the individual mandate that required people to buy insurance, which insurers feared would discourage healthy people from buying coverage. The Trump administration also has halted payments to insurers for covering low-income customers and taking on customers with higher health risks. Once again, each Colorado county will have at least one carrier on the individual market, thanks to Anthem’s decision to remain in the state after considering a departure in 2017. Individual market price changes range from a 2.64 percent cut by Rocky Mountain Hospital and Medical Service (Anthem) to a jump of 21.60 percent for Denver Health Medical Plan, a smaller local insurer. The number of carriers and plans is stable for the second straight year. Eight companies will offer individual market plans on Connect for Health Colorado, the state’s online exchange. And the number of policy options offered in both the small-group and individual markets will not change much (see Figure 1). Most Coloradans are not affected by the proposed rate increases because they get their insurance from a large employer or a government program, such as Medicare or Medicaid. The July 14 rate requests affect only policies that the state regulates — those sold on the small group market and individual market. The largest price increases since 2014 have been on the individual market, where people buy their coverage directly from an insurance company or through the state’s online marketplace, Connect for Health Colorado. Roughly 8 percent of Coloradans are covered through the individual market, although it is used more commonly in some rural Western Slope counties. Colorado’s price increases are among the lowest that have been released so far. The Kaiser Family Foundation has tracked price changes in major cities in every state that has published preliminary 2019 rates, and researchers found a wide range of changes. Colorado’s relatively low increases rank the state near Detroit (3 percent); Burlington, VT (5 percent); and New York City (7 percent). Rates for Colorado’s cities won’t be available until final rates are released. A quirky side effect of the political fight over the ACA could bring lower prices to some Colorado consumers. The Trump administration decided in late 2017 that it would no longer pay companies to provide relief from co-payments and cost sharing for their lowest-income customers. By law, customers must still receive the subsidies, so companies had to raise their prices to account for the lost federal payments. Those subsidies are available only for silver-level plans. This year, Colorado regulators chose to follow the example of most other states and tell companies to apply the price hike only to silver plans. As a result, the average price of a silver plan (before tax credits) will jump 12.30 percent, while gold plans will rise 6.85 percent and bronze plans just 0.90 percent. At the same time, the tax credits that many consumers receive to help with their monthly premiums are also based on silver plans, so those tax credits will become more generous. That means savvy consumers are likely to find a bargain on some plans when they go on sale late this fall: The more generous tax credit, based on the more expensive average cost of a silver plan, may help cover more of the cost of less expensive plans. In some states last year, consumers could find bronze plans at no cost because the tax credits covered their entire premiums. Customers qualify for tax credits if they make less than four times the federal poverty level, or about $100,000 for a family of four. About 69 percent of Connect for Health Colorado’s customers have received tax credits so far in 2018. The modest price increases that health insurance carriers have proposed for 2019 in Colorado should be taken as good news for a market that has been in turmoil the past four years. But the drama is not over. 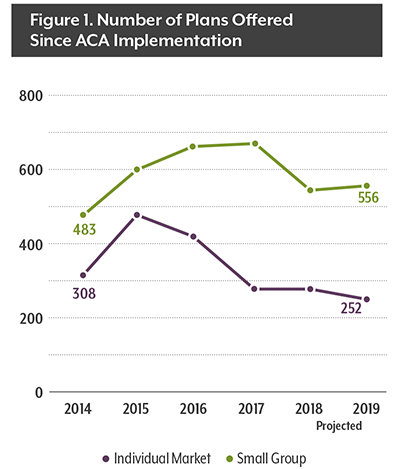 Further actions from the Trump administration or Congress could make it riskier for insurers to participate in the ACA markets in the future. And lawsuits that aim to overturn other aspects of the ACA could progress through the courts in the next year. Still, Friday’s news means that some of Colorado’s long-suffering consumers will be able to find a rare treat in the 2019 individual market — a bargain. Joe is CHI's Managing Director of Communications.